"Conservatism is true." That's what George Will told me when I interviewed him as an eager student many years ago. His formulation might have been a touch arrogant, but Will's basic point was intelligent. Conservatism, he explained, was rooted in reality. Unlike the abstract theories of Marxism and socialism, it started not from an imagined society but from the world as it actually exists. From Aristotle to Edmund Burke, the greatest conservative thinkers have said that to change societies, one must understand them, accept them as they are and help them evolve. Watching this election campaign, one wonders what has happened to that tradition. Conservatives now espouse ideas drawn from abstract principles with little regard to the realities of America's present or past. This is a tragedy, because conservatism has an important role to play in modernizing the U.S. Consider the debates over the economy. The Republican prescription is to cut taxes and slash government spending  then things will bounce back. Now, I would like to see lower rates in the context of tax simplification and reform, but what is the evidence that tax cuts are the best path to revive the U.S. economy? Taxes  federal and state combined  as a percentage of GDP are at their lowest level since 1950. The U.S. is among the lowest taxed of the big industrial economies. So the case that America is grinding to a halt because of high taxation is not based on facts but is simply a theoretical assertion. The rich countries that are in the best shape right now, with strong growth and low unemployment, are ones like Germany and Denmark, neither one characterized by low taxes. Many Republican businessmen have told me that the Obama Administration is the most hostile to business in 50 years. Really? More than that of Richard Nixon, who presided over tax rates that reached 70%, regulations that spanned whole industries, and who actually instituted price and wage controls? In fact, right now any discussion of government involvement in the economy  even to build vital infrastructure  is impossible because it is a cardinal tenet of the new conservatism that such involvement is always and forever bad. Meanwhile, across the globe, the world's fastest-growing economy, China, has managed to use government involvement to create growth and jobs for three decades. From Singapore to South Korea to Germany to Canada, evidence abounds that some strategic actions by the government can act as catalysts for free-market growth. Of course, American history suggests that as well. In the 1950s, '60s and '70s, the U.S. government made massive investments in science and technology, in state universities and in infant industries. It built infrastructure that was the envy of the rest of the world. Those investments triggered two generations of economic growth and put the U.S. on top of the world of technology and innovation. But that history has been forgotten. When considering health care, for example, Republicans confidently assert that their ideas will lower costs, when we simply do not have much evidence for this. What we do know is that of the world's richest countries, the U.S. has by far the greatest involvement of free markets and the private sector in health care. It also consumes the largest share of GDP, with no significant gains in health on any measurable outcome. We need more market mechanisms to cut medical costs, but Republicans don't bother to study existing health care systems anywhere else in the world. They resemble the old Marxists, who refused to look around at actual experience. "I know it works in practice," the old saw goes, "but does it work in theory?" Conservatives used to be the ones with heads firmly based in reality. Their reforms were powerful because they used the market, streamlined government and empowered individuals. Their effects were large-scale and important: think of the reform of the tax code in the 1980s, for example, which was spearheaded by conservatives. Today conservatives shy away from the sensible ideas of the Bowles-Simpson commission on deficit reduction because those ideas are too deeply rooted in, well, reality. Does anyone think we are really going to get federal spending to the level it was at under Calvin Coolidge, as Paul Ryan's plan assumes? Does anyone think we will deport 11 million people? We need conservative ideas to modernize the U.S. economy and reform American government. But what we have instead are policies that don't reform but just cut and starve government  a strategy that pays little attention to history or best practices from around the world and is based instead on a theory. 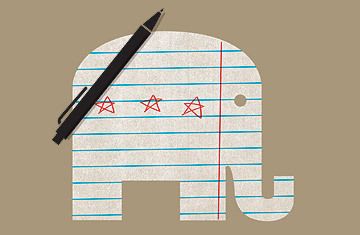 It turns out that conservatives are the woolly-headed professors after all. See four faces of Washington's reshaped political landscape.